ONE plant treating so many conditions? How. How can one plant treat so many conditions—each one so different from the next? It traces back to the amazing discovery made by cannabis researcher Raphael Mechoulam in 1992. Not that long ago! He stumbled on a physiological system that promised to change the course of (cannabis) history. The endocannabinoid system (ECS) is a network of receptors and compounds found in every human biology. It’s there to maintain the body’s equilibrium or homeostasis, which is fancy speak for regulating things like pain, appetite, sleep, immune function, neurogenesis and stress. The ECS is also what interacts directly with the active ingredients in cannabis. Mechoulam’s discovery will continue to serve as the foundation for future research on the relationship between the cannabis plant and the human body. The medical community is starting to wake up to the undeniable science which will continue to open doors for use of hemp in our everyday lives. 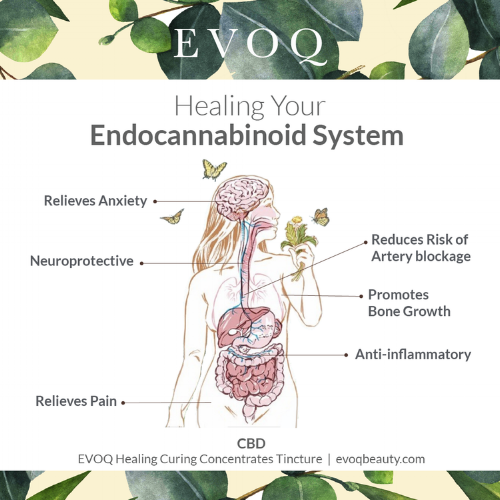 Learn more about our EVOQ CBD Curing Concentrate. Its been mind blowing to see the number of women its helped from anxiety, sleep to pain management. Older PostColor your hair? A must read if you do.